Championship leaders Norwich City's eight-game winning run came to an end after Andy Rinomhota's late equaliser earned lowly Reading a shock draw at Carrow Road. 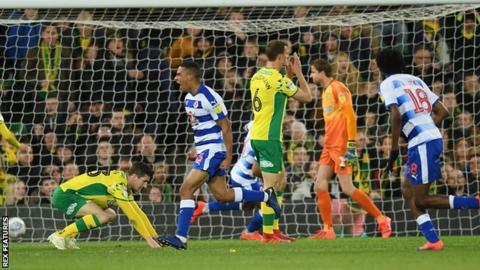 Rinomhota's fine strike in the seventh minute of stoppage time gave the Royals a dramatic point, after Norwich had scored twice in the last four minutes to go 2-1 up. Reading took a surprise lead through Yakou Meite, who latched on to Mo Barrow's delivery to fire home from close range. Ben Godfrey pulled the Canaries level in the 86th minute with a terrific strike from distance, before Christoph Zimmermann's header completed the turnaround moments later. But Reading, who had been forced to withstand heavy pressure after half-time, made it 2-2 when Rinomhota found the net deep into added time. The league leaders had been forced to chase the game after Meite gave the Royals the lead following a quiet start of few chances for either side. Norwich were without midfielder Emi Buendia as he began a three-match ban following his sending off against QPR on Saturday and struggled to make an impact for much of the game. Championship top scorer Teemu Pukki, who was named Championship player of the season at Sunday's EFL awards, had an uncharacteristically quiet night in front of goal, as he was denied by a resilient Reading defence. Godfrey and Zimmermann's late intervention should have seen Norwich clinch a ninth consecutive win to pull nine points clear of third-placed Sheffield United with five games still to play. But Reading boosted their hopes of Championship survival as they pulled two points clear of the drop zone thanks to Rinomhota's dramatic equaliser. "It was unbelievably disappointing. It was one of those days where you have to say football can be absolutely unfair. "My feeling is that we were by far the better side. Of course [to concede] in the 96th minute was disappointing. "We had 75% possession and more than 20 shots on target, Reading had two shots on target and both went in, but we have to accept it." "My players didn't deserve to lose this game. For the brave way they defended during more than 80 minutes. We changed the plan, put on one more defender. "They created some dangerous situations when they put the ball in the box from crosses. My players did really well. "One mistake and they scored and two or three minutes later they changed the game." Match ends, Norwich City 2, Reading 2. Second Half ends, Norwich City 2, Reading 2. Goal! Norwich City 2, Reading 2. Andy Rinomhota (Reading) left footed shot from the centre of the box to the bottom left corner. Assisted by Garath McCleary. Jordan Rhodes (Norwich City) wins a free kick in the defensive half. Foul by Tyler Blackett (Reading). Substitution, Reading. Danny Loader replaces Chris Gunter. Substitution, Reading. Sam Baldock replaces Lewis Baker. Jordan Rhodes (Norwich City) wins a free kick on the right wing. Attempt missed. Yakou Meite (Reading) header from the centre of the box is close, but misses to the left. Assisted by Tyler Blackett. Foul by Jordan Rhodes (Norwich City). Emiliano Martínez (Reading) wins a free kick in the defensive half. Attempt saved. Jordan Rhodes (Norwich City) header from very close range is saved in the centre of the goal. Assisted by Marco Stiepermann with a cross. Maximillian Aarons (Norwich City) wins a free kick in the defensive half. Foul by Garath McCleary (Reading). Substitution, Norwich City. Timm Klose replaces Teemu Pukki. Goal! Norwich City 2, Reading 1. Christoph Zimmermann (Norwich City) header from the centre of the box to the top left corner. Assisted by Kenny McLean with a cross following a corner. Corner, Norwich City. Conceded by Tyler Blackett. Goal! Norwich City 1, Reading 1. Ben Godfrey (Norwich City) right footed shot from outside the box to the bottom right corner. Assisted by Marco Stiepermann. Delay in match Liam Moore (Reading) because of an injury. Attempt blocked. Maximillian Aarons (Norwich City) left footed shot from outside the box is blocked. Assisted by Onel Hernández. Substitution, Norwich City. Mario Vrancic replaces Jamal Lewis. Attempt missed. Christoph Zimmermann (Norwich City) right footed shot from the left side of the six yard box is high and wide to the left. Assisted by Kenny McLean with a cross following a corner. Corner, Norwich City. Conceded by Chris Gunter. Hand ball by Chris Gunter (Reading). Christoph Zimmermann (Norwich City) wins a free kick in the defensive half. Foul by Andy Rinomhota (Reading). Substitution, Reading. Garath McCleary replaces Modou Barrow. Attempt missed. Onel Hernández (Norwich City) left footed shot from the right side of the box is close, but misses to the right. Assisted by Teemu Pukki. Corner, Norwich City. Conceded by Liam Moore. Ben Godfrey (Norwich City) wins a free kick in the defensive half. Foul by Yakou Meite (Reading). Attempt missed. Jordan Rhodes (Norwich City) header from the centre of the box misses to the left. Assisted by Kenny McLean with a cross following a set piece situation. Jamal Lewis (Norwich City) wins a free kick on the left wing. Substitution, Norwich City. Jordan Rhodes replaces Todd Cantwell. Corner, Reading. Conceded by Christoph Zimmermann. Attempt missed. Christoph Zimmermann (Norwich City) header from the centre of the box misses to the right. Assisted by Marco Stiepermann with a cross following a corner.